CorinthPark is a mixed use Creative/Live/Work Space with exhibition areas, studios and workshops as well as housing owned by Herschel Weisfeld. This is a balance to SOTA, Weisfeld’s ‘State of the Art’ building, which is a mixed use work space within a museum/gallery environment and the Sara Ellen & Samuel Weisfeld Performing Arts and Conference Center which is an award winning performing arts facility in Downtown Dallas. He is also the only two time award winner in the history of Preservation Dallas for his adaptive reuses of older buildings for which CorinthPark is a prime example. The goal of the Corinth Park installation series is to give local Dallas artists an alternative art venue to use for freedom of expression without the boundaries of a formal gallery setting. Herschel Weisfeld is a visionary with warehouse space. In 2006, he asked Sarah Jane Semrad to take on one of his warehouses in conjunction with Cedars Open Studios Tour and put on an art show to challenge the city, bring fresh folks into the Cedars neighborhood and highlight artists who need massive spaces to fret out big ideas. Artists that first year included Tim Stokes, Kate Nelson, Nevada Hill, John Holt and Ron Radwanski. The show was called the show PRIMER for a myriad of reasons. Response to the exhibit was overwhelmingly positive. " The "next one" wasn't for another couple years, but in keeping with some weird loose theme, the next experimental show was BASE. Participating artists were Nicole Horn, Scott Horn, Kate Nelson, Ron Radwanski, Luke Harnden, Zach Broadhurst, House of Dang boys, Sarah Jane Semrad and Jonathan Brooks. In 2009, FUNCTION overtook the space. 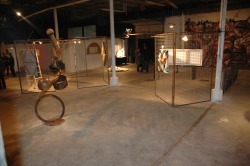 Curated by local artists Scott and Nicole Horn, FUNCTION featured numerous emerging artists in a variety of media. All FUNCTION artists are listed on the ARTISTS page of this blog.